It seems silly to be blogging about bad news so soon after a lovely Christmas. But this is a notable and deserving exception, since it involves one of the men who helped to shape my childhood. 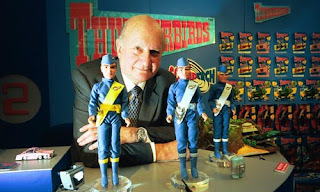 Gerry Anderson, creator of Thunderbirds, Stingray and Captain Scarlet, has died of Alzheimer's aged 83. For a sizeable part of my childhood, Gerry Anderson was the yardstick by which all other children's TV was measured. As a young boy I was mesmerised by Thunderbirds, soaking up its exciting plots, brilliant music and gripping set-pieces. Like many people my age I built a Tracy Island, Blue Peter-style, and even as I got older whenever an episode came on TV (BBC2 often repeated them), I just couldn't look away. As an adult I still hold his work in very high regard, whether it's the relatively playful action Stingray or the darker, more Gothic sci-fi of Captain Scarlet. On top of the entertainment that he gave to millions, Anderson made a number of important technical contributions to children's programming. Working with very limited budgets and under strict deadlines, he always tried to push the envelope of what an hour-long children's show could do. The pyrotechnics and look of Thunderbirds was so professional for the day that when Lou Grade was shown the first episode, he remarked that it felt like a feature film. Stingray was the first children's TV series to be shot in colour, and the look of the puppets became more life-like with every show. As much as he said never wanted to work with puppets, when it came to making shows with them, Anderson was in a class of his own. Anderson's career after Thunderbirds was not entirely a smooth one. None of the Thunderbirds films set the world alight, and for all its effort and expense, Space: 1999 has dated pretty badly. 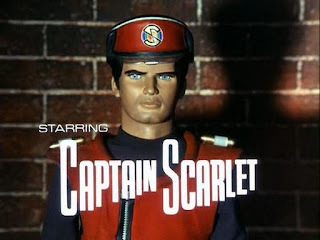 His later career would also see two of his creations badly mistreated in a bid to sell them to new audiences: the live-action Thunderbirds movie completely missed the point and tone of the series, while the CG-animated New Captain Scarlet was buried deep under ITV's Saturday morning schedules. But neither mishap has managed to tarnish the originals, or diminish the enormous fan following, which extends into everything from theatrical mime (Thunderbirds FAB) to an unofficial Japanese anime series called Thunderbirds 2086.